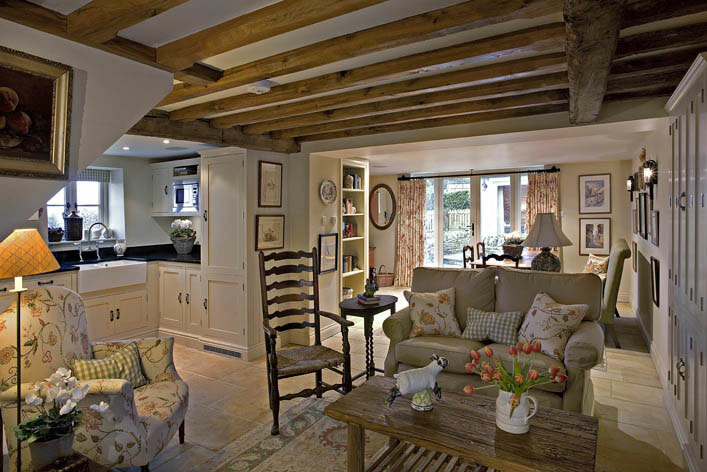 Love the warm and cozy feeling that this design and color does for this interior. I would only change the dinning and sitting areas. The dinning area would be more functional near the kitchen. It would make the kitchen look bigger, increase the food prep area and save work steps the cook has to make when setting the table and serving food. The living (sitting) area would get better lighting if it where near the glass doors. I love an afternoon sunlight shining in the living room while reading a good book. Thanks for stopping by. I agree with you. If it were my cottage, I’d change a few things, but I love the overall appeal! LIove it. Would add more white but what a neat atmosphere.Almost looks like a large doll house. Love the overall feel of this place! It seems very cozy and restful. Looks really good, and I’m looking to do similar now in my farmhouse kitchen. Possible to see if from another angle? Looking for where the cooker and fridge are stored. My kitchen area isn’t that big so looking for ideas.